Summer is here right? I am not sure. New York weather is unpredictable, for some time now. One day it’s warm and the next day you are out in the cold. Whatever. I simply don’t know what else to tell you except, if you are not a New Yorker, you better come ready for the weather. 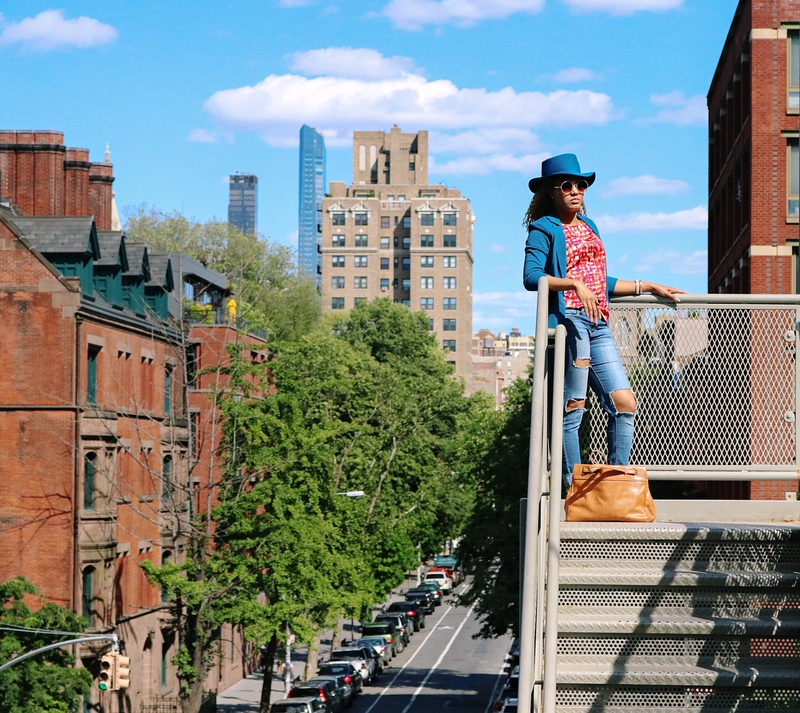 Meanwhile, I was basking in the sun on this lovely bench…and strolling the highline. One of my favorite colors is royal blue and I become very captivated when I see this particular shade of blue. I think it’s better than your average blues. It almost looks as if I was going for a monochromatic blue outfit. Which I wasn’t. Honestly, I didn’t event notice that until after I started writing this post. Remember, that show “Blues Clues?” That name just randomly popped up in my head. If you never heard of the show, it’s a kids show that used to come on Nickelodeon. Just google it. Soooo… I love fun prints and I always like to pair them with solid colors, whether, bold or tonal. I paired my top with one of my favorite blazers and matched it with some cut out jeans. Cut out, ripped, distressed, whatever you want to call it, always mix well with almost every trend. It adds a functional fun and edginess to your look. I threw on some loafers, grabbed my earth tone tote bad and topped it off with my royal blue hat. Strolling the highline is totallyy worth it. I hope you can try it one day, if you haven’t already done so. I would love to know your thoughts. What did you think of this look and comment below! Thank you for reading and Happy Styling!